Friday, 26 June 2015 was the long anticipated launch of the Stirling Smith’s own summer exhibition. The exhibition looks at the range, quality and importance of the collections. Stirling-based artists such as Hugh Green and Denovan Adam are on display beside many popular and pieces of art relating to Stirling. Aspects of social history are covered with exhibits focusing on the suffrage movement, transport and money. There are also objects with a more worldly heritage, The Mussel Gatherers of Villerville by Maurice Poirson, dominates an entire wall. There is the opportunity to meet the Samurai up close, along with pieces from Persia and Thailand/Burma. The newest treasure to become part of the collection was unveiled by Lord Bruce. 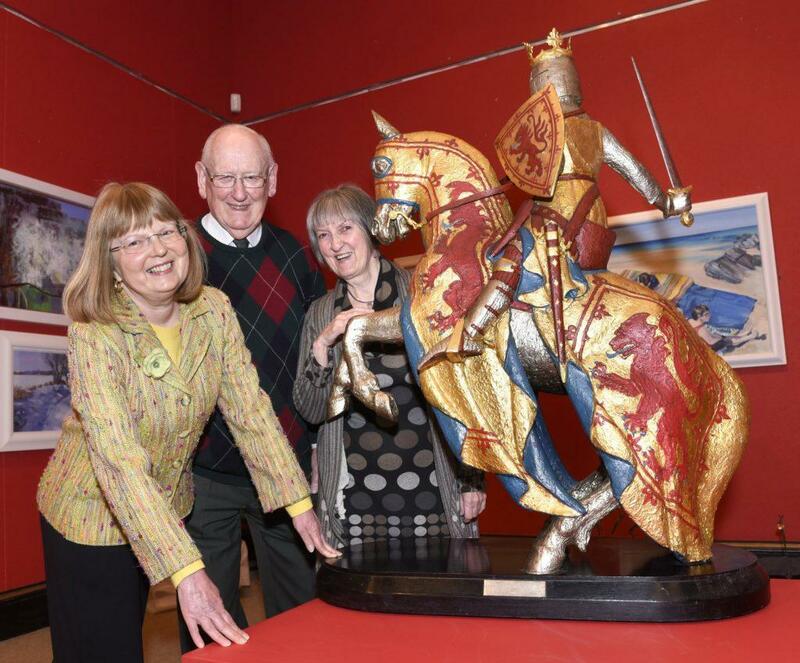 The King of Scots in Battle was one of the final designs for the Bronze statue which stands at Bannockburn. This maquette is one of 3. The original was commissioned by Chivas Regal for their Paisley Head Office. Over 80 guests were welcomed to the opening, and joined the Smith Trustees, Director Elspeth King and Smith staff to see Dr Robin Campbell awarded the Fellowship of the Smith for his saleroom and auction house skill in adding to the collection. Many of the pieces in the exhibition can be attributed to Robin’s keen eye and auction skills.